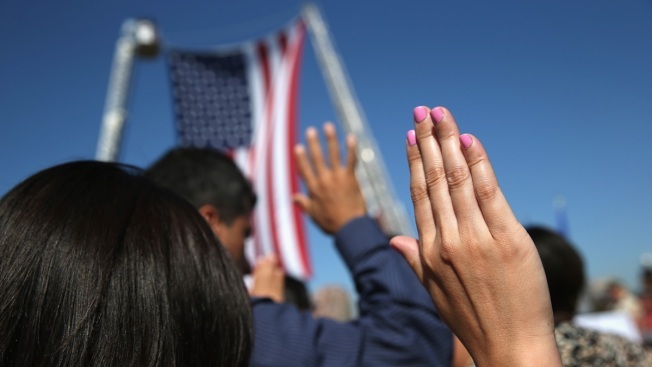 In this file photo, 100 immigrants become American citizens during a naturalization ceremony at Liberty State Park on September 17, 2015 in Jersey City, New Jersey. A new poll shows that little more than a third of Americans would pass a basic multiple choice U.S. citizenship test, NBC News reported. The survey, released this month by the Woodrow Wilson National Fellowship Foundation, sampled 1,000 American adults and was modeled after the test taken by immigrants in the process of naturalization. Respondents 65 and older scored the best (74 percent), while only 19 percent of test-takers 45 and younger passed. The survey asks about everything from important dates to historical figures and current events. How would you do on a U.S. citizenship exam? You can take a practice test on the United States Citizenship and Immigration Services website.